I’m working (slowly) on a new website, which will have a news tab for things like upcoming events, classes I’m teaching, and maybe even cool conferences and things like that — such as this one in November, which I’m very much looking forward to! In the meantime, a kindly friend pointed out that although I may potentially be teaching an editing course at Blue Heron Books in Uxbridge starting next week, there is no information here about it. Which led me to realize that there is also no information about my lovely new book that came out recently. Or the course I’m teaching through the Oshawa Seniors’ Centre, which is actually wrapping up this week. So here we have it — a news roundup. Regular-style blog posts will resume after this, including one on the CANSCAIP Packaging Your Imagination Conference and one on pink shoes. New Book! This is probably the biggest news. 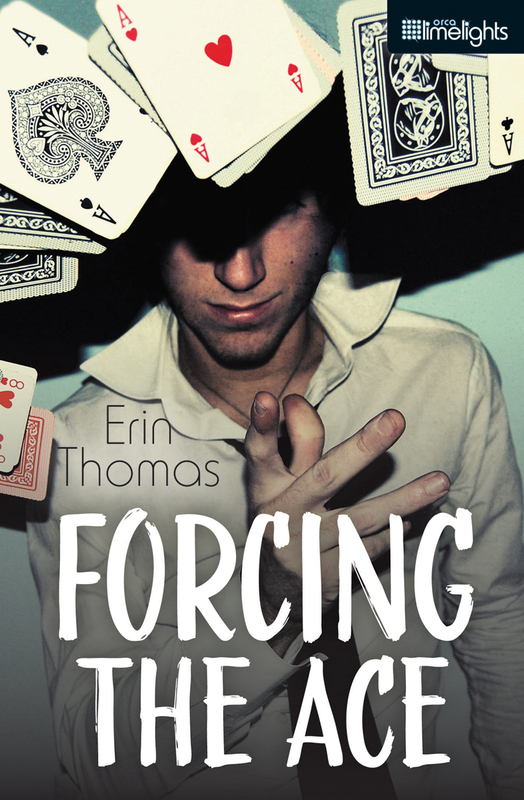 My new book, Forcing the Ace, hit bookshelves last month. It’s received some nice official and unofficial reviews, such as this one from CM Magazine. Forcing the Ace was incredible fun to write and research. I’ve written in another post about how much I enjoyed meeting magicians and talking with them about their craft, and how welcoming and friendly they all were. And now the book is out, which seems slightly surreal, possibly because it’s been a crazy few months. There was a Goodreads giveaway. There will not, alas, be a book launch this time, I don’t think. It’s just not realistic, given all that’s going on right now. Next news item: Editing Course at Blue Heron. This will run Wednesday nights, starting this week. A couple of years back I put together a one-hour workshop on editing, and many of the participants wished for a longer version, where they could actually work through some of the ideas and get feedback. This is that. Plus a lot of other ideas that I’ve picked up in the meantime. It’s intended for writers who have a manuscript well under way, if not complete, but could still be useful for someone in the earlier stages of a project. What’s Next? The Writer Unboxed un-conference is looming pretty large in my thoughts right now, as is the manuscript I’m planning to take down there. Looking ahead to the new year, I’ll be teaching again at the Oshawa Senior Citizens’ Centre, this time an eight-week course. My initial thought for that one is to tweak the assignments a little bit to encourage longer work, while providing alternate assignments or variations for those who just want to write new, short pieces week-to-week. And, of course, more blog posts. Of the usual, chatty essay style. And a new website, with a news tab. Eventually.